Choosing a pet for your family should be a meaningful process; it should not to be taken lightly. This should not be a spur-of-the-moment decision, and it's certainly not the time to be bargain hunting - there is no 'bargain' with love! Hopefully your dog will be a cherished family member, and will bring joy, love, fun, and snuggles to your family. Unfortunately, there are numerous "breeders", brokers and importers who bring puppies into the world with nary a thought to the quality or health of the puppies, nor to the emotions of the families with whom these dogs will live, but, instead, breed only for profit. Dogs found in pet shops and dogs imported solely for resale, are usually from commercial breeding farms, the so-called "puppy mills". More often than not, these breeding farms are horrible situations for the animals, and usually do not produce puppies that are emotionally or physically healthy. Do your family a huge favor: don't even consider a dog from those circumstances. The probability is that you will have spent a lot of money on an unhealthy dog that could cost many hundreds, or thousands, of dollars over its short life. Don't purchase a puppy thinking that you are ‘saving' the puppy. Yes, it will help that one dog, but that purchase only perpetuates the vicious cycle for the parents and future generations; the commercial breeders certainly won't stop producing a 'product' that sells. The reputable breeder whom you should seek is the serious hobbyist who carefully screens his or her dogs for good health, proper temperament, and correct conformation. Breed standards are the 'blueprint' for a breed, and were written for a reason: dog shows are where we keep our true bearings in keeping Cavaliers looking like Cavaliers. Certainly Mother Nature throws the occasional curve-ball, but we increase the odds of having healthy puppies by screening the parents, and preceding generations. Health testing is a personal choice with breeders; but you, as a puppy buyer, should consider this when choosing a breeder with whom to work. 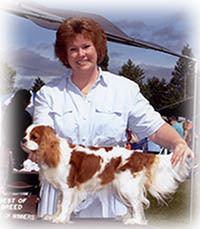 The minimum screening to be done with Cavaliers is a heart test done yearly by a board-certified specialist. My dogs have their patellas and hips checked at 2 years of age, their hearts yearly, and are checked by a Veterinary Ophthalmologist as babies, and then yearly thereafter. One of your first steps should be to develop a relationship with a breeder; and then help the breeder learn as much about you, your family, and your lifestyle as possible so that he or she can guide you in choosing (or even better: to choose for you) the right puppy for your family. Not all breeders do temperament testing, nor spend the time to carefully observe the personalities of the furry little guys and dolls - these are important aspects when you consider that a puppy will ideally fit into your family without major adjustments on your, or puppy's, part. A good breeder should be able to pick the puppy for you based on what he or she has learned, and what he or she knows of his puppies. Tis folly to pick a puppy based solely on its color, markings, or even gender! 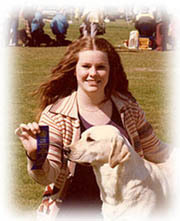 This is where the relationship, the trust, with the breeder pays dividends for many years. Please peruse my online dog pages and links, especially those for the Cavalier clubs and information specific to this wonderful breed. Doing your research and being well-informed are very important to your success. Good luck in your quest! Go back to the Cavalier page!